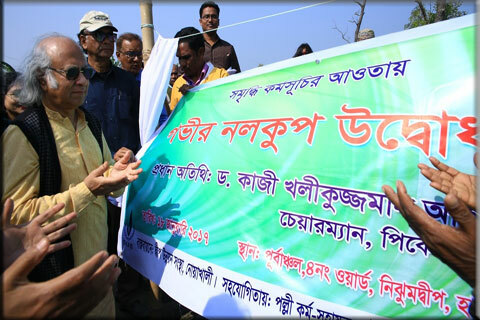 A high-level delegation led by Dr Qazi Kholiquzzaman Ahmad, Chairman of Palli Karma-Sahayak Foundation (PKSF), recently inspected different activities implemented under the PKSF’s flagship programme ‘ENRICH’ in Noakhali district. The delegation was comprised of PKSF General Board members — Ms Bulbul Mahalanbish, Mr SM Wahiduzzaman Babur, Prof Shafi Ahmed and Mr Ishtiaq Uddin Ahmad; PKSF Deputy Managing Director Dr Md Jashim Uddin, who leads the ENRICH implementation from the forefront; and journalists from the country’s leading print and electronic media outlets. 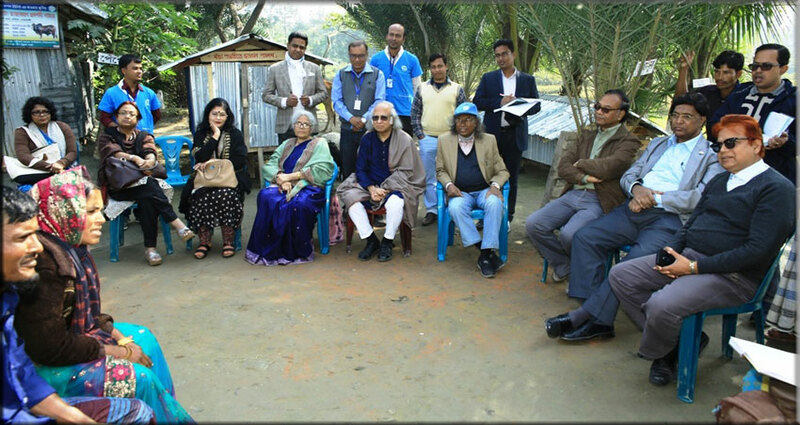 During the January 16-19 visit, they attended a range of programmes and inspected a number of ENRICH-ed households and other PKSF-supported activities implemented by Sagarika Samaj Unnayan Sangstha (SSUS) and Dwip Unnayan Sangstha (DUS), both Partner Organisations (POs) of the PKSF, in Char Elahi, and Hatiya and Nijhum Dwip islands of Noakhali. 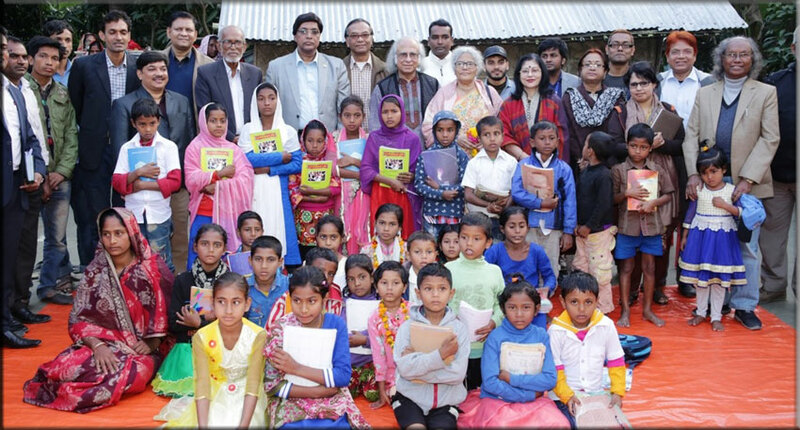 The ENRICH, a brainchild of PKSF Chairman Dr Qazi Kholiquzzaman Ahmad, works for sustained poverty eradication and beyond-poverty development for the extreme-poor households in rural Bangladesh. The programme assigns one PO in a union to effectively deliver a range of activities to ensure ‘total development’ of the downtrodden in a sustainable way and human dignity for all. The 4-day visit started with inspecting an ENRICH Education Assistance Centre (EAC) at Char Elahi in Companiganj Upazila of Noakhali. A total of 26 children, who are helped with their after-school and co-curricular activities at the EAC, accorded the PKSF delegation with recitations, songs and other performances. They also shared their experiences at the EAC with the visiting team members. Later, the PKSF delegation attended a public rally attended by around 500 people from different walks of life. Among others, Companiganj Upazila Parishad Chairman Mr Mizanur Rahman Badal, Char Elahi UP Chairman Mr Abdur Razzak and SSUS Director Mr Abdur Razzak spoke at the rally. They all highly praised the PKSF interventions there, particularly those of the ENRICH, and requested the Foundation to expand its activities there. Dr Md Jashim Uddin in his speech gave an overview of the ENRICH and how the programme was changing lives in a sustainable way. At a view-exchange meeting in the evening, the SSUS officials apprised the PKSF delegation of its different activities and sought assistance to introduce localised crop calendar and establish an artificial insemination centre for sheep there. Dr Qazi Kholiquzzaman Ahmad assured them of PKSF help in these regards. Ferdous Begum Beauty built her house in Kaladur village under Chanandi Union of Hatiya after her previous house on a char was devoured by the mighty Meghna. However, the house never felt like home due to extreme poverty. Extortions and tortures by local robbery gangs made it all the worse for her. 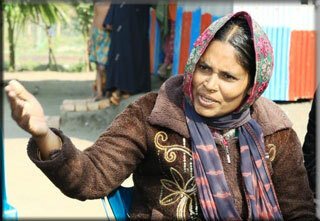 While the government forces managed to curb the crimes in the area, poverty would still torment her family. “… So much so that we would often have to go to bed with an empty stomach. And I could not even count how many nights and days we had to spend like that,” says Beauty, in her late 40s. She went on to describe how the DUS reached out to her and helped her make her house an ENRICH-ed one. Though hers was not an ENRICH union yet, the DUS provided her different types of training and necessary assistance under other PKSF-supported programmes in line with the ENRICH model of a self-sustaining household. 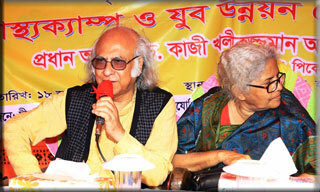 “How well are you doing financially now?” asked PKSF DMD Dr Md Jashim Uddin. “Fairly well, by the grace of Allah. Our monthly net income ranges between Tk 12,000-15,000 now,” she replied. The PKSF delegation went to three more houses there and they left each of those with stories of exemplary successes, and smiles on their faces. The next destination was Nijhum Dwip, an island in the Bay of Bengal inhabited by around 60,000 people. Though a popular tourist destination, the island did not have much lodging facilities for the tourists. This was adversely affecting the earning opportunities for the locals. In order to help them, the ENRICH took up an initiative to introduce ecotourism there. The PKSF constructed concrete house there for a family with a spare room which can be rented out to tourists as an income generating activity. PKSF Chairman Qazi Kholiquzzaman Ahmad inaugurated one such house. This is still in a pilot phase and extensive interventions will be made if this was a success, he said. Then the PKSF top-boss attended a meeting with rehabilitated Freedom Fighters at the island. They thanked the PKSF for helping them out of extreme poverty. However, there are still a number of problems that plague them, they said and requested the PKSF to help them with constructing embankments, a lighthouse and an artificial insemination centre for cattle so that they could have a better life. He later instructed the DUS officials to take necessary steps to help the islanders with what they need within the PKSF’s capacity. The PKSF delegation later enjoyed a magnificent drill on disaster preparedness and management and Qazi Kholiquzzaman Ahmad was accorded with a civil reception in Hatiya. During the four-day visit, the PKSF chairman also inaugurated ENRICH centres and deep tubewells, and attended an ENRICH fair. 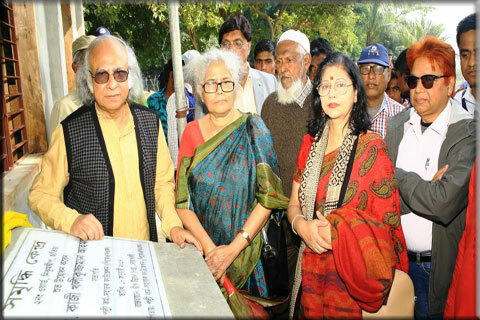 On January 19, the delegation made its way back to Dhaka. As the trawler carrying the PKSF officials and journalists sailed its way from Hatiya across the Bay to the mainland, the PKSF Chairman and the DMD (Admin) kept looking at the island slowly fading into the horizon. Both were wearing bright smiles – smiles of accomplishment and of contentment that comes from serving humanity.